Okay, so you’re ready to start working with Amazon Web Services (AWS) and cloud computing. 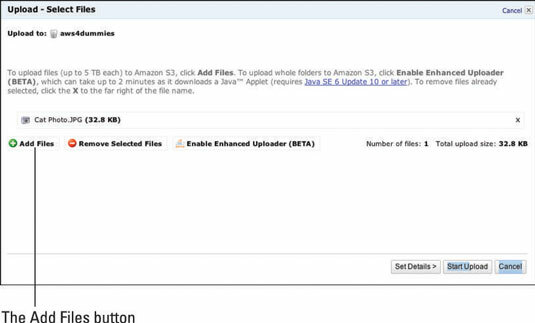 Amazon offers its own, web-based interface to enable users to work with AWS. 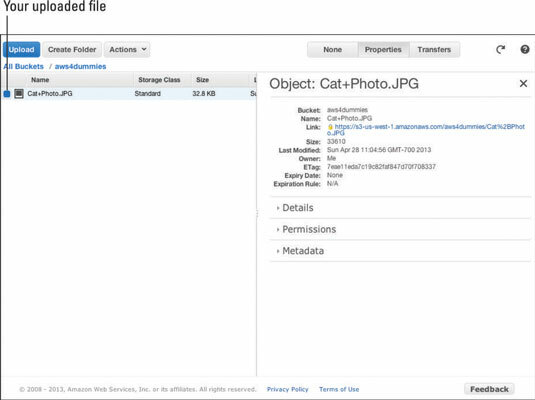 This interface, the AWS Management Console, hides all the complex details of interacting with the AWS API. You interact with the console, and Amazon’s program deals with all the complexity under the hood. For your first S3 experiment, you upload a picture that you can then retrieve and see displayed in your browser. You start out on the S3 page for managing your resources. (Refer to the figure.) Look for the bucket you just created. Found it? Good! 1Click to select the bucket you created. Doing so opens the bucket, and the right side of the screen lists a number of actions you can take within the bucket. The Upload-Select Files dialog box appears. 3Click the Add Files button. 4Using the file selector widget that appears, browse your local file system, select a file to upload, and then click Open at the bottom of the widget. You return to the Upload-Select Files dialog box. 5Click the Start Upload button in the bottom-right corner of the dialog box. After a few seconds, your bucket lists the file you just uploaded. If you click on the Properties button on the upper right, you’ll see information on the file, as shown.